Takata Corp., a Japanese airbag manufacturer, is under siege for supplying faulty and defective airbags and airbag components to the worlds largest auto companies. In 2010, Kristy Williams was one of the first casualties of Takata defective airbags. While driving a 2001 Honda Civic, shrapnel from the airbag inflators severed her carotid artery. More recently, crashes have left drivers with metal shards in their eyes. The company is experiencing increased scrutiny from regulators and lawyers as the injuries continue to mount. A Takata airbag recall has been especially concerning because the company produces nearly 25% of airbag inflators in the world. 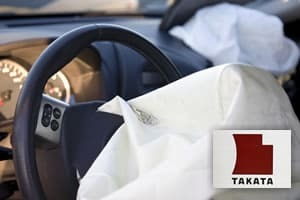 If you or someone you love has been injured by a defective Takata airbag, you may be eligible to file a damages lawsuit. Japanese airbag manufacturer Takata along with several auto giants that use Takata airbags have been sued in a putative class action lawsuit. The complaint alleges that the airbag manufacturer and the car companies sold unsafe vehicles and purposely hid airbag defects from consumers and safety officials. Have you or someone you love been affected by this recall? The auto accident class action lawyers at Goldberg Weisman Cairo are ready to assist you with all of your recalled vehicle injuries and questions. Contact us today by calling Toll Free 1-312-464-1234. Alternatively, simply click on the “Live Chat” button on this page to speak with one of our representatives 24 hours a day, 7 days a week. The primary danger in Takata airbags is shrapnel. Vehicles with Takata airbags have a faulty airbag inflator that punctures the airbags and embeds metal fragments into the face, neck, chest and torso of vehicle occupants. Since 2008, 14 million vehicles with Takata-related airbags have been recalled. Of the 14 million cars recalled, more than seven million have been recalled in the last 18 months. There are at least four confirmed Takata airbag-related deaths. Two former employees of Takata have come forward with allegations that the company secretly tested defective airbags in 2004 and deleted all evidence from the companies computers. The New York Times has reported that these secret tests were conducted outside of normal work hours in Auburn Hills, Michigan, Takata’s North American headquarters. The company is alleged to have conducted tests to determine whether airbags removed from junkyards were susceptible to rupturing and likely to release shrapnel. According to the report, officials at Takata were able to confirm that the airbags were in fact dangerous. The company, however, failed to warn anyone of the dangers. As the recall notices and allegations about the company’s knowledge continue to mount, more and more injured passengers and drivers are stepping forward to declare their injuries in what is rapidly becoming a potentially large class action lawsuit. What Should I Do If I Have A Takata Airbag? You should first identify whether your car is listed among the brands and models listed in the following tab to the right that have been made with defective Takata airbags. If so, you must act to replace the defective parts as soon as possible. You will receive recall safety notices in the mail, but you can also access them online through SaferCar.gov once they are available. Consumers are advised to follow the instructions contained in the recall notices very carefully. The National Highway Traffic Safety Administration (NHTSA) has urged owners of affected vehicles to immediately replace defective Takata airbags. Additionally, the NHTSA has required car manufacturers to maintain recall websites that detail the make, model, year and assorted information about all pending and in progress recalls for the last 15 years. The NHTSA has expressed concerns that Takata would not be able to keep up with airbag inflator replacement parts. While the dealerships and auto manufacturers are working together to expedite the recall process, Takata is being ordered to increase its capacity to produce safe airbag inflators. What Cars Have the Takata Defects?